मिलेनियम स्टेडियम, कार्डिफ २०१७ फाइनल मैच का मैदान. कप के साथ प्रस्तुत रियल मैड्रिड टीम २०१७ में. ↑ अ आ "Majestic Real Madrid win Champions League in Cardiff". UEFA.com. Union of European Football Associations. 3 June 2017. अभिगमन तिथि 3 June 2017. ↑ अ आ इ ई उ "Felix Brych appointed Champions League final referee". UEFA.com. Union of European Football Associations. 12 May 2017. अभिगमन तिथि 13 May 2017. 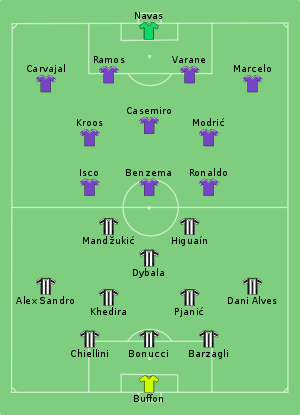 ↑ अ आ "Full Time Report Final – Juventus v Real Madrid" (PDF). UEFA.org. Union of European Football Associations. 3 June 2017. अभिगमन तिथि 3 June 2017. ↑ अ आ इ "Tactical Lineups – Final – Saturday 3 June 2017" (PDF). UEFA.org. Union of European Football Associations. 3 June 2017. अभिगमन तिथि 3 June 2017. ↑ "Cardiff to host 2017 Champions League final". UEFA.com. Union of European Football Associations. 30 June 2015. अभिगमन तिथि 13 May 2017.